Your fitness beliefs make or break your success in everything from weight loss to building muscle. Even though the Henry Ford Quote about “whether you think you can or can’t your right” is becoming a bit old hat, it’s absolutely true. Your success hinges more on what you believe than what you may know. In this information age, we’re told the key to success depends on learning the right information. This usually involves reading books and searching online for the answers to our problems. While learning is certainly important, it’s not going to help you much if you don’t address your underlying fitness beliefs. Your results are a consequence of your fitness beliefs, not just your fitness knowledge. The classic analogy of an iceberg is a good example of how your beliefs and knowledge relate. Knowledge is like the tip of the iceberg that pokes out of the water. It’s a small influence that, while more apparent, isn’t that much of an influence. 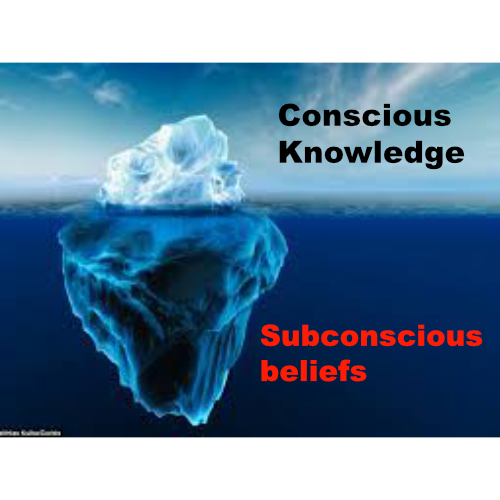 Your beliefs are the far bigger influence that resides below the surface. While they are not quite as apparent they are much more important and more responsible for where you’re going. The hardest wind and weather can pummel the tip of an iceberg and hardly influence where it goes, but a gentle change in water current can cause it to end up in different parts of the world. If you want to really take charge of your health and fitness, focus on improving your fitness beliefs rather than just your fitness knowledge. You can learn all of the information in the world, but if your beliefs never change you’ll never change. Check out this week’s podcast to learn more about why your beliefs are so important and what you can do to take charge once and for all.